Imagine a small publishing house that owned its own store. Now imagine that store is a streetcart, a stylin' handbuilt streetcart! The Street Book Revival outlines a vision for a holistic experiment/solution that will stimulate thought and discussion of public space, entrepreneurship, local economics, emotional health, writing and art. The Small Street Book Revival is organized to support the publishing of short (10-50 pages) soft-cover, affordable (in the range of three to seven bucks). It is the revival of a type of book that thrived in the 18th and 19th century. This is the revival of a medium of broad creative and democratic potential. Writing a full-length book or an article for a major magazine generally requires a level of access to agents and publishers that is beyond the reach of many people. The process of establishing 'a platform' usually takes many years. Yet every week I meet a handful of people who clearly have a level of insight, a level of wisdom, a unique vision or point of view that would make for a fascinating small book. Many of them just need to learn how to develop their wisdom, their insights, their knowledge into a well-designed, accessible street book. The books will primarily be sold off of street cart, in the great stream of public life, as they were sold in the eighteenth and nineteenth century in North America and Europe. The Urbanmonks Press has these current books for sale on our streetcart. These books can also be purchased here. All-time best seller. A great companion on the journey. Will remind you why a good mentor can make or break a life. But where do we find these mentors? Chai contains so many of the hall-of-fame spices with such amazing natural histories, cultural histories, and potent healing benefits. If you do not learn to appreciate these plants, these spices, I will publicly apologize to you. The book that is intended to outline the revival of an amazing lost medium of the street book. Soft-cover, short (10-40) pages, accessible, and affordable. 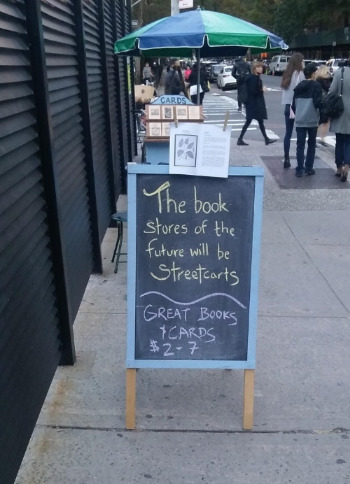 The book store of the street book is the street cart. This is the book and the bookstore of the future - and you and your community could be a part. What makes a week a good week? What makes a life a good life? The first book of the Urbanmonks Thinktank includes a workbook portion that will get you a little closer to the answer. This book helps the reader observe our emotional ebbs and flows. This mini-course is intended for schools, workplaces, families and individuals. Wisdom: A Curriculum Primer for Schools, Families and Relationships (coming Fall 2017) How do we develop wisdom year-to-year during the most important years in our childrens' and our own emotional development? This book aims to outline the layers of wisdom and how they are most naturally developed, from birth through death. "I love these street books so damn much." "Prayers and Knives changed my life." "These botanical pictures are beautiful.. and the story of the spice trade is amazing!" "These street books are mind-expanding. 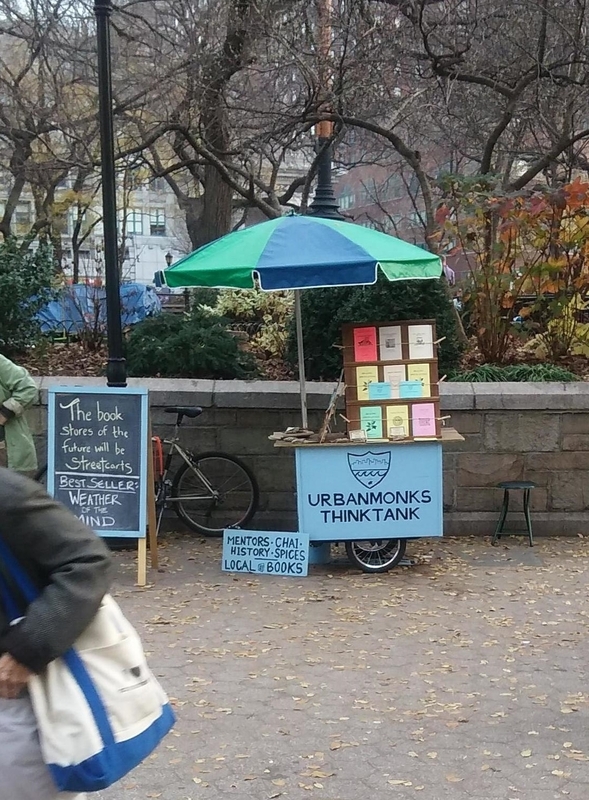 How do I get involved with the Urbanmonks Thinktank?" A publisher should focus on a few main topics, not try to spread himself too thin. This is why the Urbanmonks Press generally focuses on topics that have to do with emotional health, local economics, community health, history, sports and other topics that focus on the relationship between individual mind and groups/communities. Our topics of focus are broad but are related. We are looking for honest and thoughtful books that stimulate healthy cultural growth, a healthier mind, a healthier family, a well-rounded life, better relationships, a better neighborhood, connection to local history, sense of place, our roots, wisdom education, sports, spices, and plant wisdom. 5) Personal marketing plan – sure these will be sold on the Urbanmonks cart and the website, but the breadth of your personal network and your personal desire to sell will play a significant role in the success of your book. Also indicate if you are available for meet the author appearances at the Urbanmonks Street Cart. Classes will be given over this website starting in January 2016. However, one does not need the support of a class to write a street book, and the book I have written on the street book revival includes a thorough chapter on How to Write a Small Street Book.